The sequel to my post yesterday continues Father Le Jeune’s rant against White cynicism. Again, look closely. The differences between what Le Jeune writes in English (pretty civilly) and his Chinook Jargon (translated below, and pretty blunt) are significant! in every place all together? are in this Chinook writing. Was the KW readership really so widespread? And the use of the Duployan as well? I love the taunting of “maika taii tkope man” and wish his English had been so direct. It’s the first use of tayi sarcastically deployed I’ve seen. “Pi iawa……” is also novel to me. Any thought on that? It’s not “and there you will learn”? I would expect “alhqi”. I *really* like getting questions like these. Xiexie! * Was the KW readership really so widespread? And the use of the Duployan as well? = Kamloops Wawa had an Aboriginal readership throughout the Central and Interior Salish-speaking areas of BC — about Campbell River down the coast and then up the Fraser towards Kamloops, Lillooet, Okanagan country. It also had Native readers among the Carriers and Chilcotins. 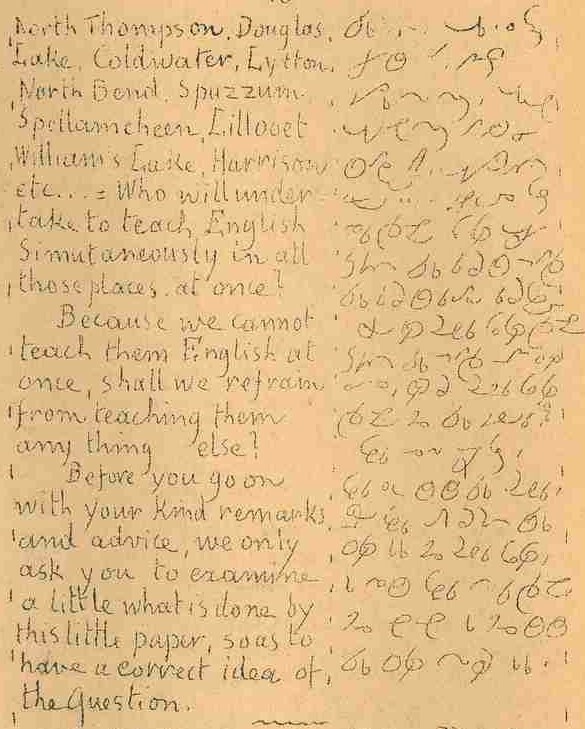 The use of Chinuk pipa (Duployan shorthand) predictably was most intense around Kamloops, among the Shuswap people who Father Le Jeune lived among, but I have found letters from as far away as Homalco and Quesnel, and have been told e.g. 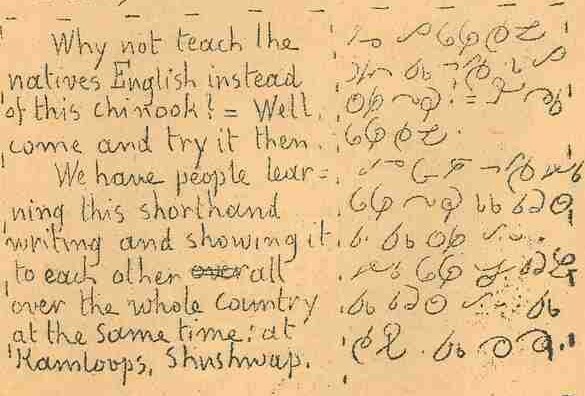 of a Chilcotin fella who kept a calendar/diary in the shorthand. * I love the taunting of “maika taii tkope man” and wish his English had been so direct. It’s the first use of tayi sarcastically deployed I’ve seen. = “Taii” here is the usual way of saying “government official”, with a synonym “gavmin” making its appearance later. But sarcasm is present here! * “Pi iawa……” is also novel to me. Any thought on that? It’s not “and there you will learn”? I would expect “alhqi”. = “Iawa”, which many readers will know as from the non-shorthand Chinook world, is most frequently used to mean “then” in the Kamloops region. To be clear that you mean “there”, you’d say “kopa iawa”. As for “alki”, that’s used much less than we English-speakers often seem to expect; in circumstances where we’d say “you will ___”, what’s normal in Chinuk Wawa is either (A) the plain verb, or (B) “alta” plus the verb. “Alta” is almost always translated as “now” in isolation, I mean when cited by itself in a dictionary, but its meaning is more clearly captured as “NON-PAST”, which covers its typical use in sequences of events: clause +”alta” +clause is the typical way of expressing that such-and-such happened “and then” such-and-such else happened. Ok, fascinating stuff. Thanks! Makes me want to go ahead and start reading the KW. I’ve seen alta meaning “then” from GR usage. But even there, they stress this use of alta predominates in story telling. Indeed the old dictionaries which focussed on the wawa of Puget north must have a lot of distortions if alta was used in this way in the north, too. It was clear from the get go even the better lexicographers back in the day were trying to map the language from a Latin-based philological background. The CW ambiguities in time marking conventions are so much more interesting!